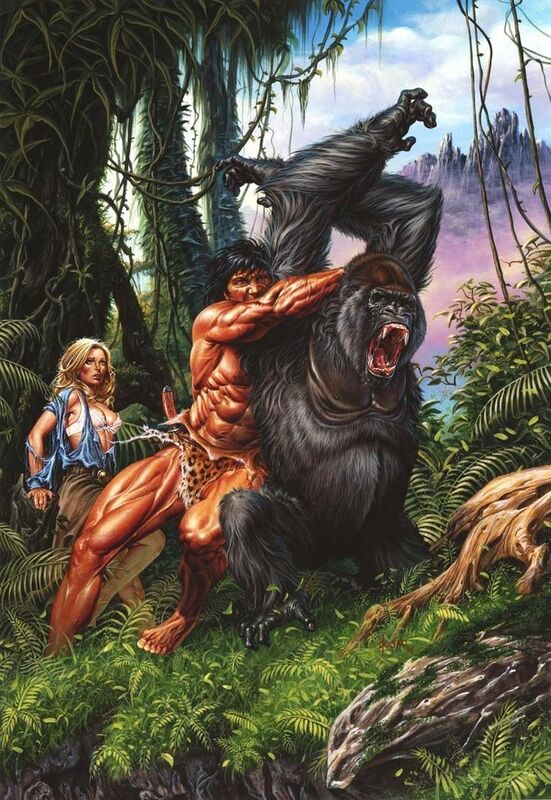 I recently finished up reading Tarzan of the Apes, because I could no longer respect myself as an Appendix N/old school SFF blogger who hadn’t done so yet (though it may be worth noting that Tarzan isn’t actually Appendix N). I’ve been meaning to write sooner, but my flesh husk has been busy regenerating from a viral plague, among other preoccupations, some of which might involve simulated trucks. At the risk of becoming the one PulpRev-oriented site that speaks occasionally unflatteringly and repeatedly of Edgar Rice Burroughs, Tarzan was okay. I’ve never been big on jungle adventures, honestly. The Solomon Kane tales that did were excellent because Robert E. Howard is a baller. Seriously, if you haven’t read any of the Kane stories, you should. It’s arguably some of his best stuff – even better than Conan. But the Jungle Book media that I’ve consumed never impressed me, and I’ve never found King Kong (I know, it doesn’t all take place there) to be particularly interesting. If you’ve never read it, your image of Tarzan, shaped by clips of old black and white films, the Disney animation, and parodies like George of the Jungle, probably amounts to an adult Mowgli-type dude who was raised by gorillas and swings around on tree vines yodeling. As is the case with Frankenstein and probably numerous other classics, the modern perception is far removed from the reality of the character. For one thing, the apes that raised Tarzan aren’t gorillas. They are more intelligent (even having a primitive vocal language of their own) and distinct from the other apes of the jungle. Tarzan himself may owe a spark of inspiration to Mowgli, but the character is basically a superhero, and I think it helps to think of many of ERB’s protagonists in this way. Tarzan is incredibly strong and adaptable, possessed of superior intellect, and is both primal and cultured. It takes him mere weeks or months to go from a savage ape-man to a European gentleman in speech and manner. Also, Tarzan does not yodel when he swings around. He gives a ferocious cry after making a kill. By the way, mild spoiler alert here. I grew to like the Tarzan character. My main complaints with the story aren’t with him, for the most part. I do think he’s a little too perfect, but again, if you think of him as a proto-Superman (similar to John Carter in some ways), this is fine. Mostly I found almost all of the supporting characters to be unbelievable and irksome. Tarzan’s French captain companion isn’t bad. He serves his purpose as Tarzan’s main gateway to civilization and the world of Man, building upon the groundwork laid by the cabin of Tarzan’s father. The hero’s cousin, Clayton, is also a fine man and a decent character. This presents its own problems. Namely, Clayton is a rival for Jane’s affections and for Tarzan’s title and inheritance. This sets up Tarzan to be noble and self-sacrificing, but it’s also a somewhat uncomfortable feeling for the reader (or at least for me). Clayton is shown to be handsome, brave, and noble. But he’s also an obstacle for the hero. I don’t intend to read the sequel, so I read the plot synopsis for the Return of Tarzan and I see that ERB deals with this by changing Clayton and making him a coward. This enables Jane to break off their engagement because he is now a cad. Poor Clayton. It would have been better for him had he died in the jungle, it seems. But oh well – Jane has to end up with Tarzan somehow, and we can’t have anyone feeling guilty on Clayton’s account! Before we get to Jane, her father and his companion are almost insufferable. Wandering into the jungle for no reason, arguing academic and philosophic points while being chased by a predatory cat and then rescued by Tarzan, and then refusing to follow him: perhaps these antics were meant to be comical, but I just found them exasperating. As for Jane, I agree with my friend Alex of Cirsova, who commented that she is the worst of the ERB women. She is alternatingly indecisive and rash, as well as fickle. Jane is part of the reason Clayton doesn’t work as well as he could have. At the start of the story, the two are taken with one another. And why not? She’s pretty, and he’s a handsome, brave, virtuous, rich British noble. But as soon as she gets a look at Tarzan, she’s instantly over Clayton and smitten with our jungle god. Because man is he hawt. This may cut close to reality, and we pulp fans do like our alpha males who take what they want. But it reflects poorly on Jane, I think. Clayton is a fine, upstanding man whose only demerit here is that he’s not an exotic demigod. He’s a likable character and he’s just been spurned by the female lead for purely superficial reasons. Understandable, perhaps, and realistic, sure. But not very admirable. Besides this, at least in the first book Jane doesn’t really show any of the fierceness (or of course loyalty) that Dejah Thoris and even Dian of Pellucidar do. A couple things in the book’s favor – ERB was masterful at both action and at hitting certain emotional beats (that he seems to hit in every story, but they keep working!). The same is true in Tarzan. There’s some epic action, and some gripping feelzy moments. I especially liked the story of Tarzan’s parents. So it was an enjoyable read. I’m glad I read it. But I don’t really feel much desire to continue with the series. I’ve still got a bunch of Barsoom waiting for me! I wasn’t able to finish “Tarzan” myself. I remember really liking the Barsoom novels as a kid, but I wasn’t impressed when I looked back at them as an adult. I much prefer the other Burroughs, William. I haven’t read any of William’s stuff. The more I read, the more convinced I am getting that ERB wasn’t a terribly sophisticated plotter, but he had a very good understanding of what notes to hit in a story to elicit certain emotions in most readers. And he capitalized upon these same notes repeatedly and to good effect. William Burroughs is an acquired taste, and not for everyone. I recommend reading the first chapter of “The Soft Machine”. If it doesn’t intrigue you, don’t bother reading anything else, and don’t feel bad about it. What W S Burroughs writes is an epistemological murder mystery where the reader is the victim. Some people like to be scared, so they read Horror fiction. Some people like to be simultaneously confused and disgusted, so we read Burroughs. PCBushi, this is your site, say what you like. I would recommend that you read the Return of Tarzan at some point in the future. It, more than any of the other second books in ERB’s series, is really the second half of Tarzan of the Apes; they should be read as if they were one book. I can see why you (and Cirsova) don’t care for Jane as written in this first book; it didn’t bother me because I thought that ERB was describing what some cultures call “The Thunderbolt”. That is, what happens when two people who are meant for each other finally meet. I’ve seen this in real life, and it can be tragic for some of the bystanders. Jane does change over the course of the first five Tarzan books, and has a role in books 7 and 8 (and a few of the later books as well). So she is not always the teenage girl you meet in the first book. This also gives her more screen time than Dejah Thoris has in the Barsoom novels. As for the plot synopsis you read, ignore it. All too often, a synopsis of a pulp classic is written by someone who feels the need to look down on the author. Regarding William Burroughs, I’ve never been able to get into his work. His influence is immense, though. Hope you’re feeling better. No fun being sick, especially in the summer time. Given the recommendations I’ve been getting from you and others, I won’t write off Tarzan for the future. Still, too much other stuff on the shortlist to get back to him in the near future! But I’m starting to think you either like his style of story or you don’t. But Gita liked Monster Men despite bring down on Barsoom, so may be something there. At some point I will try Tarzan, just to fill out my reading education. But right now, I’m in no hurry to learn. I’ll point out that Son of Tarzan can be read on its own with no necessary background knowledge other than Tarzan was a jungle man who got married, moved to England, and had a kid. Son of Tarzan is a favorite; Meriam alone is worth the price of admission. Also, I think that is the book where ERB places Tarzan in the same fictional Earth as Sherlock Holmes. This may cut close to reality, and we pulp fans do like our alpha males who take what they want. But it reflects poorly on Jane, I think. Clayton is a fine, upstanding man whose only demerit here is that he’s not an exotic demigod. Oddly, you have identified the thing that broke Dagny Taggart and by extension Atlas Shrugged for me (well, one of them…they are some others). Realize that is way off topic for a pulp site but I think it is worth pointing out for writers in general. Your overall assessment probably isn’t that far off; I like the Tarzan books that I’ve read, but that certainly doesn’t mean they’re without flaws, and I’ve yet to go past the first three. I do think you are being a little hard on ERB for Clayton’s change. I have seen similar development in real life, not only in others, but even in my own life, where one sin unrepented of erodes one’s whole character. It may have been kinder to Clayton to simply kill him, but that would, I think, have seemed no less contrived. That’s possibly true, and you have a point that people do change. I suppose for me it’s just a sympathy for Clayton’s character that makes the sudden change a rather naked device to deliver Jane to Tarzan. I’ve read Tarzan of the Apes a few weeks ago myself for the very first time. I watched the disneyfied version as a kid, and while I liked it, it didn’t facilitate any growing affection in me for Tarzan. I was shocked to learn that he is a century old character and the he appears in a total of 25 novels published by his creator, Edgar Rice Burroughs. Consumed by summer time boredom, I decided to try something different from my normal reading, so I started reading Tarzan of the Apes on a whim. I have to say, I had a lot of fun with it. I think it helped that my expectations coming into the novel were lower than the ratings for this year’s Emmys, and I was in a mood for something more adventurous. While I could on and on about how ridiculous the titular character and the circumstances he finds himself in are, it would be pointless considering that it’s a century old story. Edgar Rice Burroughs never tried to create a complex story or anything, and as such, I didn’t treat it as anything than what it was intended as. Which is another thing that I enjoyed about it; the lack of preachiness and pretentiousness was refreshing in these modern times where so many contemporary books that come out have the writers looking down their noses at the reader. Burroughs never considered himself a mover of society, and thus never lectured his readers on how they should behave in society. Yet ironically, his stories have lasted long and inspired so many generations after his death. I love this especially because it pisses off modern pretentious, condescending “critics”, who hate his guts, because he is a constant reminder that their idea that entertainment should always be propaganda and not fun for fun’s sake is dead-wrong, and that’s a plus for me. Sorry for the long rant. Overall, a fun read, and I do look forward to reading the rest of the Tarzan books. I’ll just say that I liked John Carter a lot more. Thanks for your thoughts, Constantin! I’m with you – enjoyed Tarzan but I also like the Barsoom stories much more.